My boys are definitely meat eaters and this dinner definitely did not disappoint. I love that the instant pot effortlessly cooks our usual slow cooker favorites in a fraction of time. 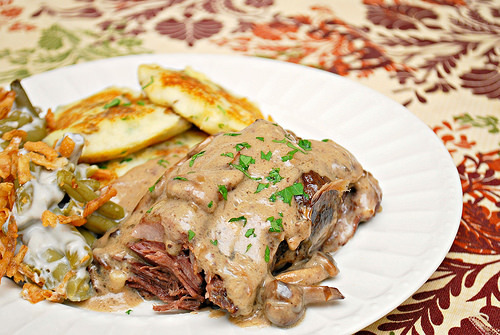 A family favorite, this French Onion Pot Roast was not only quick but comforting too. A seasoned beef roast is cooked with onions, mushrooms and french onion soup mix. The resulting juices leave a savory gravy to serve alongside. Comfort food at it's finest! This recipe cooks up in no time while tasting like it cooked all day. Pressure cooking meats really is magical and I am amazed how I've gone without a pressure coooker until now. The key in this recipe is cutting up the beef roast in smaller pieces so it cooks up quickly without being dry or tough. I broke up my roast in 4 pieces which worked well with the timing. If your roast is a little bigger, add a minute or two in the pressure cooking time and the natural release time. If your roast is smaller, deduct a minute or two just the same. I've found pressure cooking takes more intuition depending on the weight, size, and shape of what's being pressurized... so as they say, there is a learning curve. A delicious learning curve at that! Plug in the IP and add oil, onions and mushrooms; cooking until softened. Meanwhile, season your chuck roast pieces with pepper and garlic powder. Add chuck roast pieces, onion soup mix and chicken or beef broth to the pot. The display will reflect ON while the IP comes to pressure. Allow a few minutes for your IP to come to pressure. Once at pressure, the display will reflect 45 (the number of minutes you initially set) and will begin to countdown to 0 minutes. When the IP beeps after pressure cooking for 45 minutes, allow your IP to naturally release pressure for 20 minutes. While naturally releasing pressure (also known as NRP or NR), the display will reflect numbers counting up from 1. The numbers indicate how many minutes the IP has stopped cooking since it beeped (or how many minutes it has been naturally releasing pressure). No need to touch your IP while it naturally releases pressure. When the display reflects 20 minutes (which is 20 minutes since the IP has beeped), turn the setting on top of your IP to VENTING. Doing so allows the IP to quickly release pressure (also known as QRP or QR). I use a wooden spoon to carefully turn the setting to avoid close contact with the potential steam. You may also want to turn your IP away from cabinets to allow the released steam to escape freely. The pin at the top of your IP will drop when all pressure has been released and it's safe to open. Carefully transfer chuck roast pieces to a serving platter and tent with foil to keep warm. Press SAUTE on the IP and stir in cream of mushroom soup until incorporated through for a gravy. To serve, pour gravy over pot roast, garnish with parsley and enjoy with your favorite side dishes!